Set tonight for a new test of the MSI GS65 8RF Stealth Thin, a thin and light ultrabook armed for intensive gaming. Its beautiful screen with ultra-thin borders, its elegant design and good performance are some of the highlights highlighted by the tester. 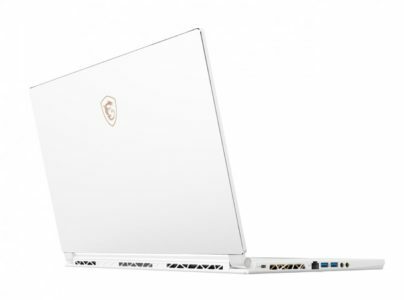 At first glance, the MSI GS65 8RF Stealth Thin impresses with its metal case. The materials seem upscale, the look is discreet and the overall design very elegant. However, the quality of the chassis does not equal the Aero 15x, especially in terms of rigidity. Under pressure, the base like the cover bend quite easily and produce unflattering crackling noises. Some elements do not fit together well and the two parts of the base are not joined as expected. The tester can only applaud the very compact format of the chassis that said. With only 1.8 inches of thickness, the GS65 is one of the thinnest gaming laptops on the market today. The weight is even more impressive (1.8 kg) and surpasses all competition (Aero 15x: 2.1 kg, Asus GM501: 2.5 kg). Connectivity is good even if the lack of card reader should annoy some. The presence of two separate audio and microphone ports is welcome for players. The rest of the connectivity is identical to the Aero 15x: a RJ45 Ethernet port, HDMI video and Mini DisplayPort outputs, three Type-A 3.1 Gen 2 USB ports, a Thunderbolt 3 USB Type-C port and a Kensington lock. The tester finds the positioning of the interfaces a little awkward because of the two air outlets present on each side and the ports are too close together. The GS65 has limited maintenance options compared to the Aero 15x which provides access to all major components. The GS65 does not have a maintenance hatch, so you will need to remove the bottom cover to access the internal components. This requires removing 15 Phillips screws and carefully raising the bottom cover of the rest of the housing. At this point, only the fans, the battery and the Wifi card are accessible. For the rest, it will lift the motherboard, a tricky maneuver because of the many cables. 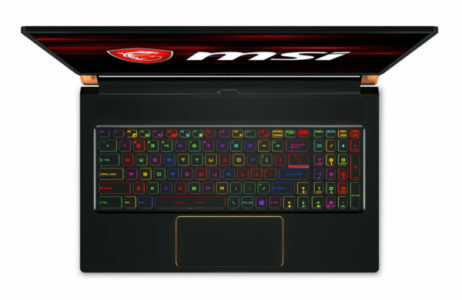 MSI has developed the keyboard of the GS65 8RF with its partner SteelSeries. The latter looks like all those crossed on the GS and GE series. The GS65 has a multi-color (RGB) keyboard backlight, whose intensity and colors can be adjusted for each key. The typing experience is good overall even though the tester would have appreciated more resistance. What’s more, the distribution of keys is not traditional and MSI could very well have slipped a numeric keypad. The touchpad evokes greater enthusiasm. Its surface is of good size and allows to slide well the fingers with a nice click. Multi-touch gestures are fully supported. 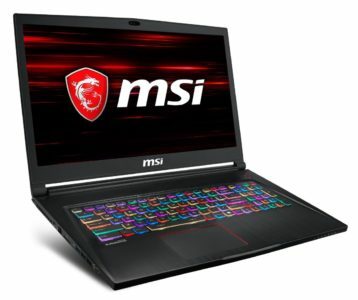 The MSI GS65 8RF Stealth Thin integrates a full HD (1920 x 1080 px) IPS screen with refresh rate of 144 Hz. A plus for the liveliness of the display. Its contrast ratio is excellent (1150: 1) but the brightness is not as good (262 cd / m²). The IPS panel provides wide viewing angles and colorimetry on the top of the cart with almost all the sRGB space covered and a Delta E around 2. Despite its compact measurements, the model in test is a real gaming machine. It contains a Hexa Core i7 Coffee Lake, 16 GB of RAM and a M.2 NVMe PCIe SSD of 512 GB. In practice, this base is capable of take care of all kinds of tasks, even the most demanding, with perfect fluidity. The tester, however, notices a slight phenomenon of freeze noticed when one makes a right click on the desktop or on the tasks, that imputes to the configurations with Optimus. The GS65 8RF in test does not show the best behavior in Turbo Boost either, but it is not perceptible everyday. The graphic part is entrusted to the GeForce GTX 1070 Max-Q. The denomination Max-Q characterizes its design, thought to slip into fine ultrabooks. Slightly less powerful than a GeForce GTX 1070, it can easily deal with the most demanding titles with details set to the maximum. The compromise of design lies on the definition: the game in 4K is excluded on most titles. The sound of ventilation is never a problem on this MSI GS65 8RF Stealth Thin. Even when using a game, it is limited to 42-44 dB, which is relatively quiet for a gaming laptop. By cons, their roar is high enough perched, which makes the perception a little more embarrassing. 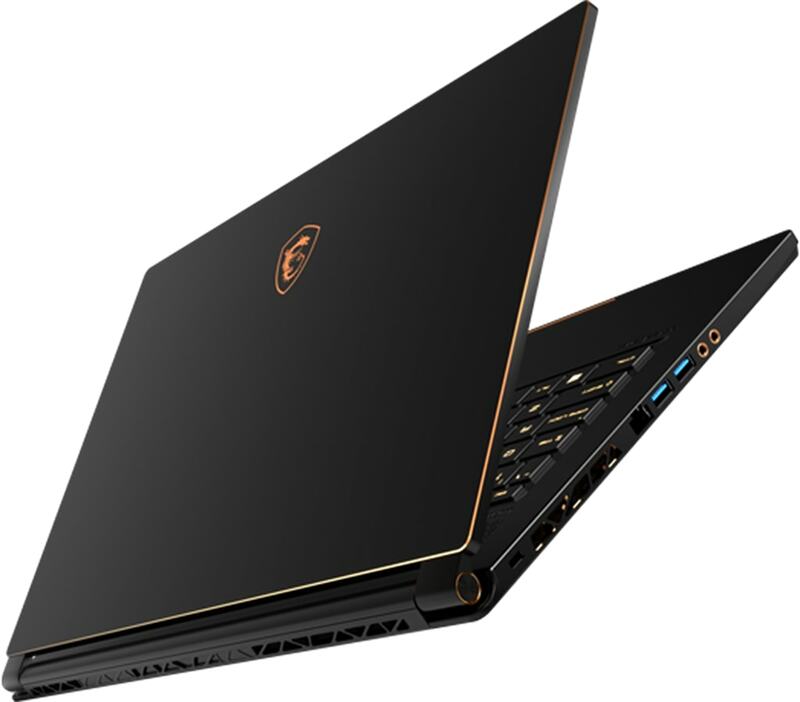 Like noise, the GS65 manages its temperatures better than the Aero 15X. The surfaces heat reasonably but do not allow to play with the machine placed on the knees. Count a little over 6 hours and 30 minutes in Internet browsing with active WiFi. This is satisfactory for a PC game but the Gigabyte is better with 8:30.